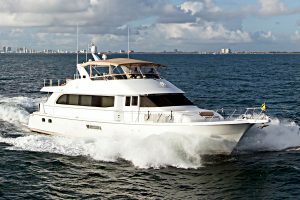 75' Hatteras Motor Yacht reduced by 60K! Will be at the Miami Yacht Show : Atlantic Yacht & Ship, Inc.
75′ Hatteras Motor Yacht reduced by 60K! Will be at the Miami Yacht Show! This used 75′ Hatteras Motor Yacht was reduced by 60K today! “Coho,” is by far the most well equipped and upgraded 75′ Hatteras Motor Yacht on the market today! The very knowledgeable owner has not missed anything when it comes to making sure this yacht stands out and above all the rest! Not to mention, every update possible has been done by the previous owner in the amounts of $250,000. She is ready to go for a long time. This is the boat to buy if you are looking in the 70-80 ft. range! Set to make an appearance at the Miami Yacht Show in February if she is still available! Coho is quite possibly the most customized 75′ Hatteras Motor Yacht ever built. She has spent over half her life in the Great lakes and in heated storage when not being serviced. In 2010, over $150,000 was invested to update the boat. This included a hot tub and custom grill on the bridge. New soft goods were installed inside and out. 10 new flat screens were added throughout and the entire entertainment system was upgraded. After all, this 75′ Hatteras Motor Yacht has been captain maintained since day one. The paint is flawless and she truly shows as-new condition. Contact Chris Carroll at Atlantic Yacht & Ship, Inc. for more info today. Check out this beautiful used 75′ Hatteras yacht for sale in Florida! Just Listed: 100′ Hatteras Yacht – See her at the Miami show!